My sister is allergic to nuts. This puts a damper on enjoying things like cookies at a party where the package is not available to look at. Her solution is to have her husband eat one and then give him a kiss. If her lips tingled, she knew those cookies were unsafe. No, Biff — I said you’ve got the MOVES like Jagger! At first I thought Biff had lipstick on! 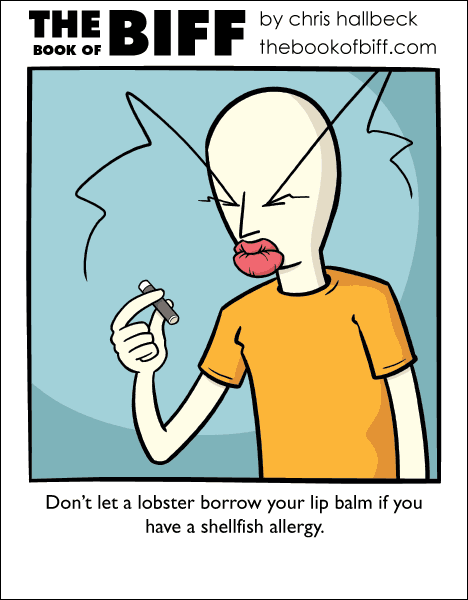 But I don’t think it would be a very good idea to let a lobster borrow your lip balm no matter if you are allergic to shellfish or not. I somehow imagine that the lobster would just pinch the lip balm to pieces instead of using it. Lobsters got lips, and clams have thighs! I just have to say that finding this right before I get sick for half a week is like some kind of miracle. I had an awesome time reading through the archives. Biff is now one of my favorite webcomics! But if he didn’t share, then Biff would be shellfish! loaning your lip balm to someone? why not zoidberg?